By ALLEN M. JOHNSON JR.
NEW ORLEANS — Addressing the most politically explosive issue in New Orleans since Hurricane Katrina, a review of a national report Friday recommended that planners throughout the region “discourage” re-settlement in areas vulnerable to destructive flooding. The panel further suggested creating a “smaller footprint” for redevelopment within a 350-mile long hurricane protection system of the metro area, including low-lying areas of Orleans , Jefferson , St. Bernard and Plaquemines parishes. “Although it can be a politically charged topic, the option of voluntarily relocating some structures and residents is one means to help improve safety and reduce flood damages,” the review states. The science panel’s proposals were contained in a review of the final draft of the U.S. Army Corps of Engineer’s Interagency Performance Evaluation Task Force — also known as the IPET report. A massive investigative study of why the city’s 350-mile hurricane protection system failed during Katrina, the final report may be released in May, IPET director Ed Link, a professor of engineering at the University of Maryland , said Friday. 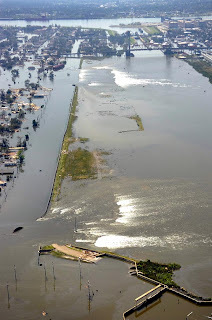 In its review of 7,500-pages of interim IPET reports published through June 2008, the National Academies committee warned that many of the “lessons learned” from Katrina have not been “adequately implemented” in the metro area. The scientists said a “smaller footprint” for the metro area, “especially in areas below sea level,” might create a more manageable and cost-effective flood protection system for the Greater New Orleans area. The costs of rebuilding and strengthening 350 miles of levees, are “substantial,” the report states. The panel recommended consideration of a voluntary buyout program, which is already under study by the corps. Higher-ground areas of the region, found closer to the natural Mississippi River levees, are “inherently” safer than “extensive” lower-lying areas of eastern New Orleans and St. Bernard Parish, the report states. Hundreds of people in Orleans and St. Bernard parishes died during Katrina. Tens of thousands lost their homes. More than 100,000 mostly black residents remain displaced from their old neighborhoods. Shortly after Katrina, a national panel of urban planners recommended that the city rebuild along a smaller “footprint” of the “green-spacing” of the highly flood-prone neighborhoods. However, many storm-stressed residents viewed the proposal as a “land grab” by developers. In the ensuing uproar, Mayor Ray Nagin — then facing re-election — backed away from “smaller footprint” plans. ITEP’s director, Link, said Friday that he agreed with the recommendations on neighborhood relocation. “The bigger increase in risk is coming from more and more people moving into areas at-risk (for flooding) than changes in climatology,” Link said. Local officials should protect public safety and property by discouraging development in the worst areas for storm-surge flooding, by land use and zoning regulations. On hurricane evacuations, the scientists report said more systematic studies, planning and communication is needed. Longer-term strategies, such as improved local and regional sheltering; and locating facilities for the sick and elderly away from high-hazard areas, should also be considered. Link said are three types of maps in the IPET report that New Orleans area residents can view on the corps’ Web site: flood-depth charts; economic-risk maps and a “loss of life” map. The data is displayed by subbasins not by neighborhoods.